Join us on Pura Vida Divers as we drift effortlessly in the Gulfstream searching for the unique and rare. Hovering in 20ft of water over a depth of 400ft in the open ocean, this one-tank night dive allows divers to witness the largest migration on the planet…the diurnal migration. The Black Water Drift Dives offer macro photographers a challenging and beautiful new cornucopia of subjects to photograph. Creatures living hundreds of feet below the ocean waves swim toward the shallow depths in search of food under the protection and cover of darkness. See breathtaking bioluminescent creatures, jellies, squid, and the larvae stages of many reef creatures. 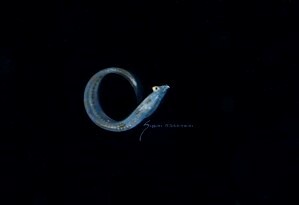 Each Black Water night dive is different and unpredictable. You never know what animal, small or large, will pay a visit. You could encounter everything from tiny fluorescent-colored eels to adult sailfish and dolphins. Many of the creatures observed on the black water drift dives are commonly seen on the reefs during the day except they look nothing alike. You see jellyfish, squid, lobsters, fish, eels…but usually all at the larval or planktonic level. Take for instance this photo of a Florida Spiny Lobster taken on our Black Water Drift Dive. We also see plenty of the unknown as well. Alien-like creatures drifting upwards from the depths. Comb jellies (ctenophores) are also a fan favorite and widely available to photograph on most dives. The trip departs around 7:30pm and we conduct a 90 minute dive, drifting in 400ft of open ocean water. If you’re ready for an adventure into a world like nothing you’ve seen before, reserve a space today!